The US and world economies are drifting inexorably into the next recession owing to the deflationary collapse of commodities, capital spending and world trade. These are the inevitable "morning after" consequence of the 20-year global credit binge which has now reached its apogee. The apparent global boom during that period was actually a central bank driven excursion into the false economics of household borrowing to inflate consumption in the DM economies; and frenzied, uneconomic investing to inflate GDP in China and the EM. The common denominator was falsification of financial prices. By destroying honest price discovery in the financial markets, the world's convoy of money-printing central banks led by the Fed elicited a huge excess of financialization relative to economic output. 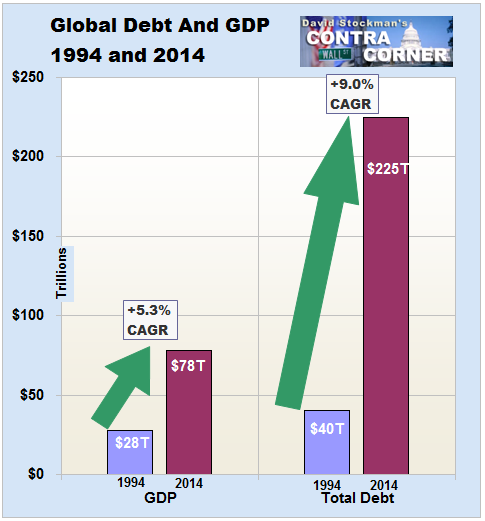 The central manifestation of that was $185 trillion of debt growth during the past two decades------a stupendous explosion of credit which amounted to 3.7X the expansion of global GDP. And even that ratio is an understatement. That's because measured GDP has been artificially bloated by the monumental worldwide malinvestment and excess capacity arising from the credit bubble. That is, phony "growth" which under the laws of economics will be liquidated in due course. But you wouldn't have known that the global economy is about to hit the skids from Monday's action. Bernanke kicked off the day in a Wall Street Journal op ed taking a bow for "saving the world". Then the stock market completed a rally from Friday's post-NFP low, which amounted to 84 points (4.5%) on the S&P 500 during a seven-hour span of trading. That was even less time to "mission accomplished" than last October's three-day Bullard Rip. 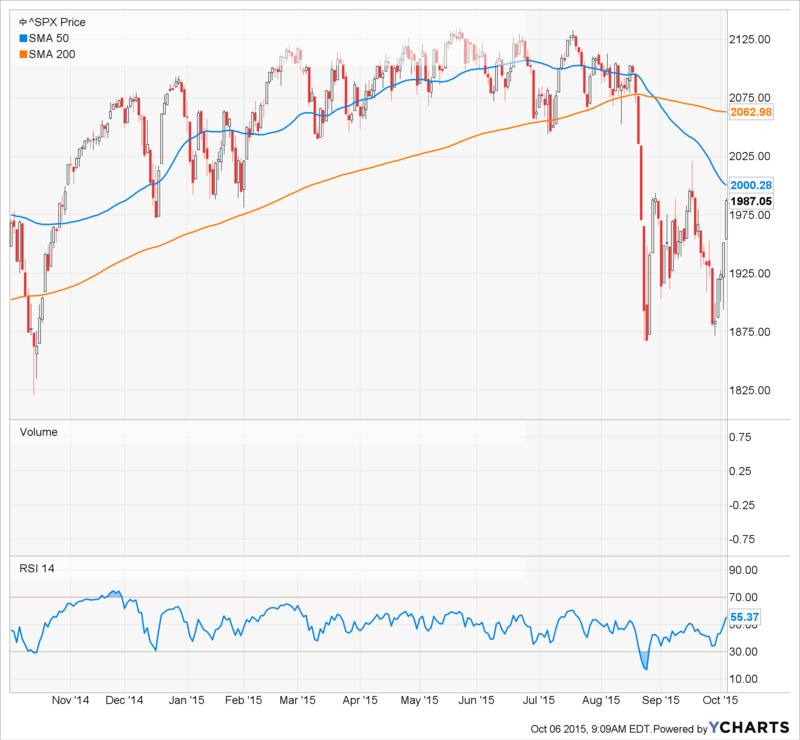 So here we are again circling the 2000 mark on the S&P 500---a level first crossed 440 days ago. Undoubtedly, the casino is knee-jerking upward because Goldman has already made an unsecret audible call, instructing the Fed to substantially defer lift-off well into next year. That Goldman Sachs is peddling the lunacy of potentially 100 straight months of zero money market rates is not surprising. There is no greater gift to the gamblers who comprise its clientele than free money for their carry-trades----and especially when accompanied by the absolute certainty that there will be months of forewarning through Goldman's house organ before the Fed permits even a 25 bps change in the cost of speculation. Oddly enough, however, the Goldman bull-hug on the Fed is exactly why the casino has become a clear and present danger to the main street economy. To wit, under the Hatzius-Dudley-Wall Street mantra of perpetual ease the Fed has become a serial bubble machine, but the retrograde academics and career apparatchik's who nominally run it do not have a clue about this destructive modus operandi. Exhibit number one for that proposition is Bernanke's self-justifying balderdash printed in today's WSJ. The kindest thing you can say about it is that now that he is cashing in big time he ought to hire a better qualified intern to write his articles while he's out flogging his book. This gem is an embarrassing smattering of banality and bunkum. Above all else it does not give even a passing nod to the fact that the US operates in a tightly integrated global economy and financial system; that the very warp and woof of it have been bloated and distorted by central bank enabled leverage and speculation; and that the central banks of the world are now engaged in a desperate and self-evident scramble to keep the financial bubble they have inflated over two decades from collapsing upon itself. Bubble vision was chattering endlessly yesterday, for example, about the sudden implosion of Du Pont and the expulsion of its CEO. Well, its crashing sales in Brazil were as much a part of the global bubble as the now abandoned ramshackle man-camps of North Dakota. In the latter case, the Bernanke-Yellen lunacy of ZIRP drove desperate money managers into a scramble for yield that caused them to buy the debt of shale drillers and suppliers dependent upon stable $75 oil prices in radically volatile global commodity markets. In the former case, DuPont's booming ag sales in Brazil ultimately were derived from a rampaging printing press in Beijing that caused China's debt to soar by 56X in less than 20 years. That's right. Brazil's massive export boom was indirectly funded by China's hideous credit expansion under which outstanding debt soared from $500 billion in 1995 to $28 trillion at present, according to the cautious estimates of McKinsey and probably by far more if it could all be honestly reckoned. Yet DuPont's tumbling earnings came as a surprise not only to Wall Street analysts but apparently to its CEO as well. All had been drinking the central bank Kool-Aid that Bernanke was still dispensing in his WSJ blather. To hear him tell it, the Fed's policy has been a roaring success, having ended the financial crisis, pushed the US economy nearly back to its full potential at 5.1% unemployment and nudged inflation upwards at 1.5% or nearly to its 2.0% target. Well, as Bill Clinton might have said it all depends on what a few years ago means. 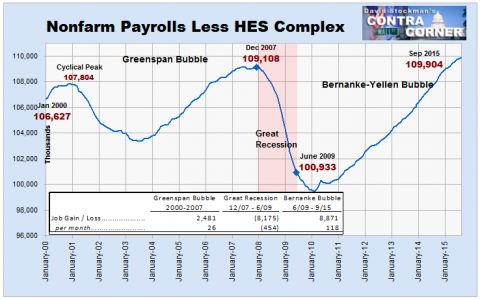 Never has the Bernank explained why the financial markets and the main street economy crashed in the fall of 2008. But counting job growth from the bottom of a bursting domestic housing and credit bubble that was self-evidently enabled by the Fed hardly counts as proof of anything. Here's a better take on the jobs front. The September jobs report showed the grand sum of 96,000 jobs gains for the entire US economy outside of the government financed Health, Education And Social Services sectors (HES Complex) since December 2007. Needless to say, the Fed's ZIRP and QE policies had absolutely noting to do with the hiring of more home health care workers, nurses and teachers aides. Yet outside of those fiscally-dependent domains all of Bernanke's radical financial repression and $3.5 trillion monetization of the public debt barely got the jobs market back to where it started before the recession; and, actually, not much beyond where it stood in January 2001. So lets see. The Fed's balance sheet has grown from $500 billion to $4.5 trillion or 9X during that span, but job growth outside the HES Complex amounts to less than 2%. For crying out loud, that's a 12,000 per month rounding error in an economy which has 250 million adults. 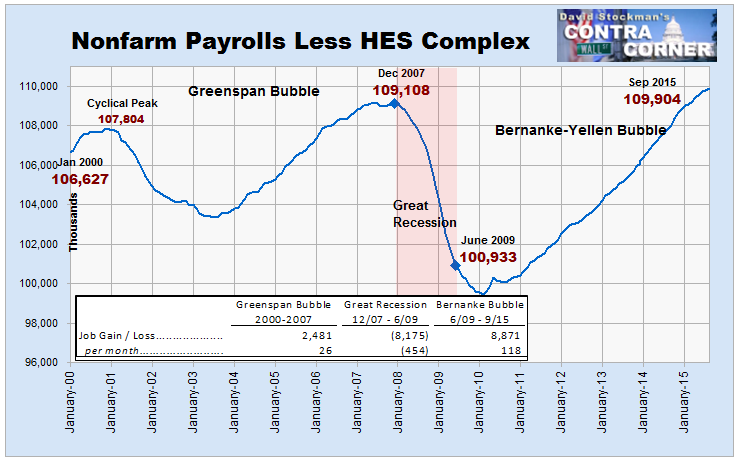 Virtually every job gained since December 2009 shown in the chart below was not a "new" job at all; it was just a "born-again" job that Greenspan had claimed credit for a few years earlier.Yet Bernanke has the nerve to boast about the Fed's success on jobs and claim that the "labor market is close to normal"! Then there was the claim that the higher rate of growth from the pre-crisis top in the US compared to Europe was further proof of the Fed's wisdom. Not exactly. Its just proof that if you pick the right time intervals you can prove anything you want. In this case, Europe had a bigger boom before the 2008 peak and has suffered a more prolonged payback for its excesses ever since. Between 1995 and 2008, for example, the Eurozone's real per capita GDP grew at 2.2% per year versus 2.0% for the US. Indeed, Bernanke's gratuitous attack on German Finance Minister Wolfgang Schauble for consistently rejecting the Keynesian playbook and being so honest as to refer to the launch of QE2 in November 2010 as "clueless" is especially grating. Germany has actually achieved a balanced budget, and a slightly better real GDP growth rate (1.1% per annum) than the US (0.98%) since Greenspan's phony housing boom peaked-out in 2006. Obviously, neither growth rate is anything to write home about, but these small differences certainly don't prove that running up the national debt and running the central bank printing press at warp speed will bring about the Keynesian nirvana of full employment. But that didn't stop Bernanke's flood of sophistry. He first assailed Europe for adherence to policy "orthodoxy" and then claimed resort to aggressive monetary and fiscal stimulus by Washington accounts for a material difference in macro performance after the Lehman crisis. There are many differences between the U.S. and Europe, but a critical one is that Europe’s economic orthodoxy has until recently largely blocked the use of monetary or fiscal policy to aid recovery. Economic philosophy, not feasibility, is the constraint: Greece might have limited options, but Germany and several other countries don’t. And the European Central Bank has broader monetary powers than the Fed does........Europe’s failure to employ monetary and fiscal policy aggressively after the financial crisis is a big reason that eurozone output is today about 0.8% below its precrisis peak. In contrast, the output of the U.S. economy is 8.9% above the earlier peak—an enormous difference in performance. No it isn't. As is evident above, Germany's growth has not lagged, yet it was subject to the same allegedly retarded ECB monetary policy that ostensibly held back the rest of the eurozone. And to complete Bernanke's Keynesian catechism, it dramatically tightened its fiscal management in the past few years. So Germany's debt-to-GDP ratio has turned down, and is now sharply lower than that of the US. The fact is, the eurozone stagnation since 2008 is due to a surfeit of monetary and fiscal stimulus in the peripheral countries before the crisis, not Germany's reliance on unkeynesian "orthodoxy" in its aftermath. Does the Bernank think that Spain's housing boom and crash was not caused by easy money and vast public expenditures by Spanish governments prior to the PIIGS crisis; or that the unavoidable liquidation of these bubbles in Spain and the rest of the PIIGS is not what brought down eurozone growth rate to the stagnant averages he cites? Meanwhile, the United Kingdom is enjoying a solid recovery, in large part because the Bank of England pursued monetary policies similar to the Fed’s in both timing and relative magnitude. C'mon! London (along with New York) is the epicenter of the global financial bubble. The economic boom there is due to the convergence of worldwide flight capital, represented by the Russian, Chinese, EM and petro-state bubble winnings that have sought refuge there. Presumably the BOE does not issue pounds sterling in London and non-London denominations. That is, there is one monetary policy for the whole country that cannot possibly alone explain these vast differences. What can explain them is the chart below. 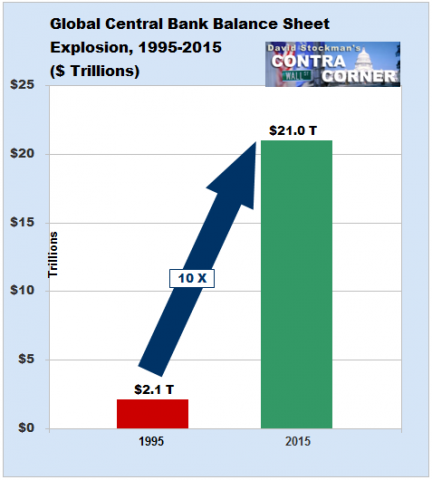 The great financial bubble of the last two decades is global because all of the central banks have been doing the same thing. To wit, radically expanding their balance sheets, thereby systematically falsifying the cap rate for long-term investment and fueling a crack-up boom that is just now beginning to visibly fracture. That London has heretofore disproportionately shared in that false prosperity is not owing to the fact that the UK hired a Goldman banker from the central bank farm team in Canada, who proceeded to out-Bernanke the Bernank. Its due to the fact that London has good property laws; speaks English, has a large international airport; is a historical center of world trade and finance; adheres strictly to the rule of "don't ask, don't tell" when it comes to the immense international thievery which flows its way; and has a tolerable gulfstream climate, rich culture and improving food. "..... by mitigating recessions, monetary policy can try to ensure that the economy makes full use of its resources, especially the workforce." Yes, and what was it that precipitated the Great Recession on a worldwide basis if it was not the mad-cap money printing policies and resulting $185 trillion global credit expansion shown above? Bernanke didn't explain, but his argument amounts to saying that first central banks cause bubbles, then crashes, then recessions. After that they rinse and repeat, denying that they had any accountability whatsoever for the economic slump at hand. Yesterday's trade report for August contained figures which crystalize Bernanke's bubble blindness and Keynesian time warp in spades. Namely, that US exports of nearly all categories of goods and services are falling sharply after the temporary post-crisis surge that was caused by the world concert of money printing central bankers. As the global deflation gathered force, the commodity sector was the first to manifest the reversal------ with prices down by 50% on average. Not surprisingly, US exports of industrial supplies and materials have dropped from their 2014 monthly peak by 20% thru August. Likewise, overall goods exports were down 10% from the 2014 peak, and even export of travel services was down by 10%. That is, activity in domestic lodging and resorts was goosed by the global boom, and will soon be cooling owing to the global bust. Needless to say, even as Bernanke was boasting about how he filled the domestic bathtub of GDP with that invisible ether called "aggregate demand" and thereby restored the nation's economy to something "close to full employment", he did let one absurdity slip that is surely dispositive. Considering the economic risks posed by deflation, as well as the probability that interest rates will approach zero when inflation is very low, the Fed sets an inflation target of 2%, similar to that of most other central banks around the world.......by keeping inflation low and stable, the Fed can help the market-based system function better and make it easier for people to plan for the future. Right. But don't mention that to the tens of millions of main street savers and retirees who have been literally expropriated by the Fed. And especially don't mention that to the casino gamblers who are once again being led to the slaughter by the Fed's adherence to Bernanke's Keynesian gospel. Alas, this is the third time this century. By now the gamblers are fully deserving of the just deserts which lie directly ahead.